the answers come from within, when we stop to listen! celebrating our inner visions and songs. Dreaming the world into being. Off-the-grid on private land near Upottery, Devon. We have added an extra day for 2016 due to all the requests to do so! Includes 3 night's camping and organic vegetarian catering. inspires your vision, and nourishes cooperation in the spirit of friendship. Take the time to connect to others, to Spirit and to this beautiful land. Practitioners - This is a place to nourish ourselves, exchange energies and healing, and recharge our batteries. 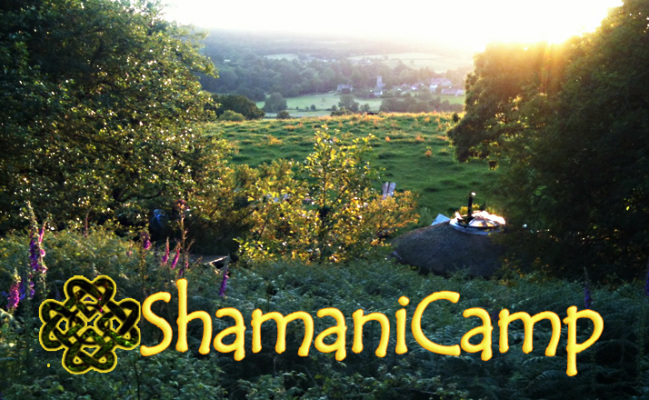 Non-practitioners - If you've received a shamanic healing or are interested in shamanism, this is a wonderful place to immerse yourself in a shamanic energy-field. Experience experts sharing their gifts. Numbers are limited to 45 so this will remain an intimate gathering. All tickets purchased from this page pass through Paypal. You will receive an email confirming your order. Once payment is received, you will be sent a booking form and then Joining Instructions of what to bring and how to find us. Please note that all tickets sales are non-refundable. As we are an intimate gathering we will not be sending paper tickets. You will be checked-in to the Camp on arrival day. Unfortunately due to the nature of our shamanic work, minors under the age of 18 are not allowed.